Food served Tue–Sat noon–1.45pm, 6.45–9.30pm. Closed Sun/Mon. Michelin-starred restaurant with rooms, where chef Paul Kitching's unique creativity shines through in every bonkers dish. Set in stunning Georgian townhouse rooms, Paul Kitching's 21212 has held a Michelin star since 2010. But put your preconceptions about such starry dining aside – this is a rollercoaster ride of taste, texture and above all of presentation. Diners sit side by side on love seats and menu decisions are restricted to a strict choice of two starter options, a soup, two mains, a cheese and two desserts (hence the name 21212). That said, at lunch and dinner midweek you don't have to go the whole hog and can decide to have a smaller number of courses. It's all very theatrical, from the pun-tastic names to the mismatched crockery, to the pouring of porridge milk (a pre-dessert palate cleanser) from a ceramic cow into miniature paper cups. Kitching admirably seems to set out to shatter the stuffy, starchy Michelin perception. More power to his elbow, but this won't suit every diner seeking to worship at the temple of 'fine'. Menus change weekly and most ingredients are sourced locally, while service is generally slickly professional, yet with a welcome touch of personality. 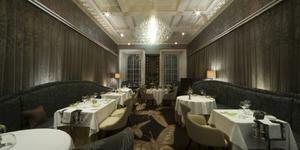 21212 is an exclusive fine dining restaurant with rooms located in the heart of Edinburgh. Situated in a Grade A Listed Georgian Townhouse, the building has recently undergone a multi million pound transformation.The four beautifully appointed large bedrooms, with dedicated lounge areas, are split over the two upper levels of the house, offering commanding views over the gardens and the historic Calton Hill to the rear and stunning views of the city of Edinburgh to the front. On a clear day, bedrooms 1 and 21 also offer views to the Firth of Forth and beyond.Each bedroom's decor is different in theme and style and facilities include ensuite bathrooms with either a free-standing bath and walk-in shower or a specially designed wet room. Guests also have their own flat screen plasma television, and extensive storage spaces. Christmas dinner: to turkey or not to turkey? For some of us, Turkey will always be the centrepiece to our Christmas table. But, if tradition's never really been your thing then these tips from chefs across Edinburgh and Glasgow should help you find a tasty alternative to try out this year.